We collected 10 cm diameter cores of lake sediments using a coring device deployed from a boat. 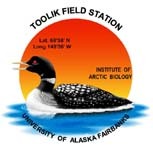 Cores were immediately returned to Toolik Field Station where they were held in temperature controlled water baths at ambient lake water temperatures. The water overlying the sediment cores was exchanged with filtered (0.7 um pore size, precombusted GFF filters) epilimnetic water from each study lake. Following the exchange of the overlying water core tubes were sealed with a continuously logging oxygen probe inserted in each probe. Dissolved oxygen concentrations in the overlying water were recorded in 5 minute intervals. At the beginning of each experiment dissolved oxygen concentrations were recorded for approximately 4 hours while the cores were complete darkness, and rates of benthic respiration calculated from the rate of oxygen consumption. Following the initial dark treatment irradiance was increased at approximatley 2-hour intervals. Shade cloth was used to filter ~80%, ~60%, ~30% of irradiance and the final treatment was at full light capacity. Photon flux density (uE/m2/s) was recorded at each varying light interval. Definition: Depth of where sampled. Either a depth in meters or description of relative dept. Definition: Treatment of cores if any.